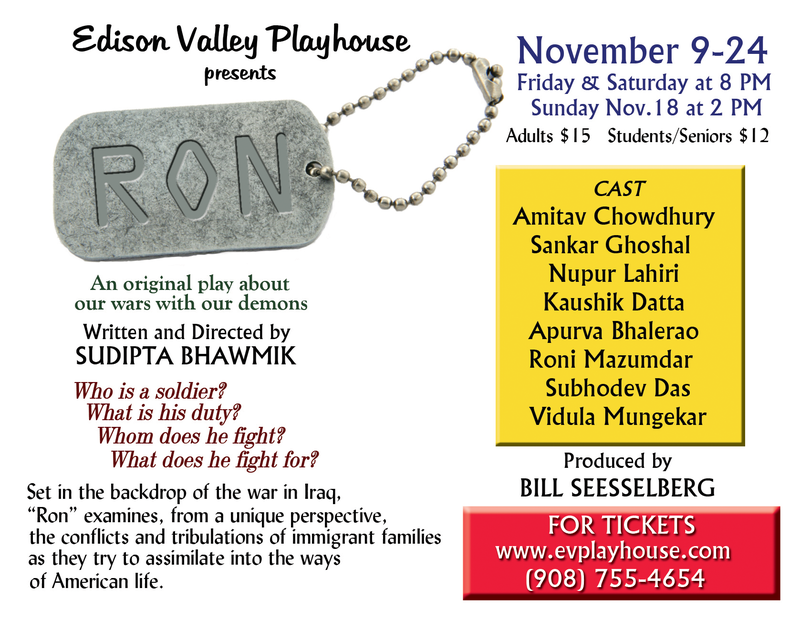 After a gap of more than six years, my play Ron is being staged again in New Jersey. 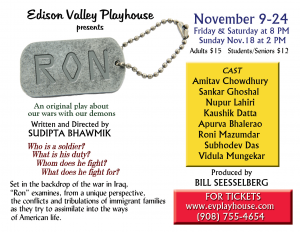 Although this time it is produced by a mainstream American community theater company, Edison Valley Playhouse, a question may naturally arise – why now? The Iraq war, which forms the background of the play, is officially over. America still does have a presence in Afganistan, but its size is nowhere comparable to that in Iraq during the peak of the war, and withdrawal from Afganistan is almost imminent. America’s primary enemy, Al-Queda has been all but destroyed. Bin Laden is dead. Although the possibility of another war is not out of question, the American people are not going through the same levels of stress as they were during the Iraq war. Under these circumstances, is Ron still relevant? Before analyzing the relevancy of the play, let’s trace the path of Ron over the past few years. After our (ECTA) final show in 2007, Ron has been staged in USA by several theater groups, in multiple languages, in California, Maryland, Pennsylvania, Florida and just recently (Sept 2012) in Chicago and has received rave reviews and complements. This kind of tells us that Ron still strikes a chord in the heart of its audience. I guess, the primary reason for this is, Ron is really not about the war in Iraq or any specific war for that matter. It is more about our internal wars with our own demons, the wars we keep fighting each and every day. Ron tells the story of an immigrant Bengali family and their friends. As immigrants to this land of opportunity, most of us have a relatively affluent life style. But how much of an American have we become? Outside our professional life, we hardly associate with the American life around us. We may have acquired American citizenship or permanent residentship, but we failed to blend into the melting pot. We hardly watch a baseball game or a football game. Rather we still love to watch cricket online or on pay-per-view satellite channels, read Anandabazar Patrika online daily, watch ETV Bangla or Tara Muzik channels. We spend our weekends at Bengali parties and enjoy “Panthar Mangsho” and “Luchi”. Our children have also devised ways to deal with us. When they speak with us in English they use an accent that is familiar to our ears and when they talk to their American friends they immediately switch to one that’s familiar to them. But as they grow up and start to make their own decisions, things start to change. And more often than we want, their decisions and actions conflict with our values. We want to stick to ours and they want to stick to theirs. But doesn’t it sound familiar? Hasn’t this been the case for generations, irrespective of geographical boundaries? So when, in the play, Ron challenges his father saying, “Didn’t you do the same? I understand Grandpa and Grandma were not happy when you decided to come to this country and stay back. But they accepted to lose their son, didn’t they?” Animesh has no answer to defend himself. And this is where the play starts to become relevant and universal. Bibhas Chakrabarty, the celebrated theater personality of Bengal, pointed out this universality of Ron when he saw this production at the Ganakrishti Natyotsav in 2006 in Kolkata. But generation gap is not the only issue in Ron. It’s only one of the components of the conflicts that we go through in our life of voluntary exile. And the most important is the conflict between our split loyalty, our split values. When Surajit, the journalist from Kolkata, attacks Animesh and his friends with piercing queries and challenges them to confront their beliefs, things start to fall apart as the characters have no other option than to expose their inner demons. As the play progresses, the audience undergoes a cathartic experience which they soon realize has little to do with war in Iraq. Rather it makes them realize that their inner battles are far more violent, far more dangerous. And the only way to win is to face them boldly – like a soldier in a battlefield.